There are so many amazing televisions in the market right now so it can be pretty difficult to decide which one will best suit your needs. The choice is really wide, and there are TVs for everyone’s taste and needs. There are smaller-sized TVs for those who are looking for a perfect little TV for their kitchen, bedroom, or some other small room in their home, and then there are bigger-sized TVs manufactured to provide amazing theater-like viewing experience in your own family room or living room. Those less demanding customers will be satisfied with a standard TV that doesn’t include many fancy, new features, such as smart functions. However, many users nowadays are looking for a feature-rich, LED Smart TV that will provide them with more fun, versatile viewing experience and entertainment. If you are amongst those customers, the Samsung UN50J5200 might be a really great choice. Samsung is a well-known TV manufacturer, and there’s no doubt that their products are of high-quality. You can’t go wrong there, and this TV is an amazing Smart TV with loads of great and fun features to play with. What’s So Great about Samsung UN50J5200? To start with and, hopefully, to get your attention, here’s what is so great about this TV. With Smart TV features, Full HD 1080p, and integrated Wi-Fi, this 50-incher ensures a high-resolution picture whilst at the same time allowing you to access smart applications or browse the web in order to find your favorite media with ease. Amazing screen and incredible smart features are definitely its biggest highlights, but there are some other great features worth mentioning as well. It boasts DTS Premium Sound 5.1 that provides surround sound, whilst the Motion Rate 60 provides seamless motion for a fun and enjoyable viewing experience. Also, you should know that Samsung TVs have the brightest screens in the industry, and the eco sensor feature is included with the UN50J5200 for intelligently adapting your screen’s brightness in order to help efficiently manage energy use. Finally, you will surely find the Anynet+ technology really neat and helpful, since it allows you to remotely control up to your twelve other compatible devices. This TV provides a resolution that is twice as high as those standard HDTVs. 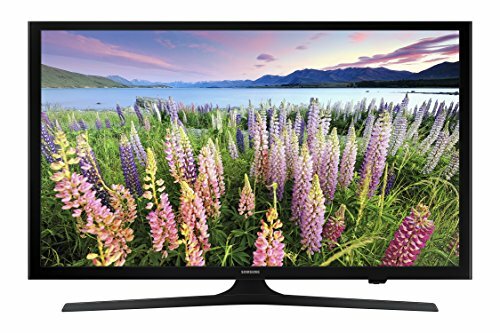 This Full High-Definition 1080p resolution allows you to view your favorite movies, games, and shows in crisp and clear detail. All those who like to organize family movie nights in their home, as well as game lovers, will surely appreciate how their favorite games and movies appear on the Samsung UN50J5200’s amazing screen. We already mentioned a Motion Rate of 60, and this feature will provide that your television keeps up with all the great action on-screen. Fast action scenes will appear great on this screen thanks to the TV’s processing speed, backlighting technology, and quick refresh rate. Wide Color Enhancer is also an amazing feature that we need to mention as it ensures quality brightness and color for this TV. Versatile capabilities of this great Smart TV allow you enjoy content from a really wide range of different sources. In order to stream and share content, all you need to do is to easily connect this Smart TV wirelessly with some of your compatible devices. Samsung Smart TV also supports lots of applications via Samsung App store providing you with easy access to all your favorite social media and streaming services. You can easily and seamlessly surf the web and browse online shopping listings, watch videos, or catch up on news and social media on this big screen thanks to the Samsung UN50J5200 LED Smart TV web browser and built-in Wi-Fi.